There are times when it’s a joy to lavish a bit of extra love and care on a recipe. Heat the oven to 200°C/180°C fan/gas 6. Put the lamb neck fillet in the baking dish with the red onion and garlic, season well with salt and pepper, then drizzle with olive oil. Roast for 45 minutes, then set aside to cool. Once cooled, chop the lamb into rough 2cm chunks and put in a large mixing bowl. Roughly chop the cooled onion, then add it to the lamb, along with the chopped garlic and cooked rice. Wilt the spinach in its bag in the microwave on high for a few minutes (or wilt spinach in batches in a large pan – add a few drops of water, cover and put over a medium heat for 2-3 minutes). Tip into a colander, then use a wooden spoon to press out as much liquid as possible from the spinach. Put the drained spinach in a clean J-cloth or tea towel, then squeeze out as much water as you can. Roughly chop the spinach, then add to the bowl. Add the rest of the ingredients (except the filo, butter and sesame seeds) to the bowl and mix until well combined. cling film or a slightly damp tea towel). Layer 5 sheets in the base of the buttered ovenproof frying pan, allowing the sheets to overhang the edge of the pan, giving the pan a quarter-turn as you work so the sheets overlap slightly. Push each new sheet into the sides of the pan. Reserve the remaining 2 sheets of filo for the top. Spoon in the lamb/rice/spinach mixture, then fold the edges of the pastry into the middle to encase the filling. Brush the remaining 2 filo sheets with butter, scrunch them up and lay on top of the pie to cover any gaps. Brush over any remaining melted butter and scatter over the sesame seeds. Bake for 40 minutes until golden brown and crisp. Leave to cool in the pan for 10 minutes, then scatter over the extra chopped herbs and serve. Look out for spinach sold in microwaveable packs. Pierce the top of the bag, then microwave according to the pack instructions – it saves washing up another pan. 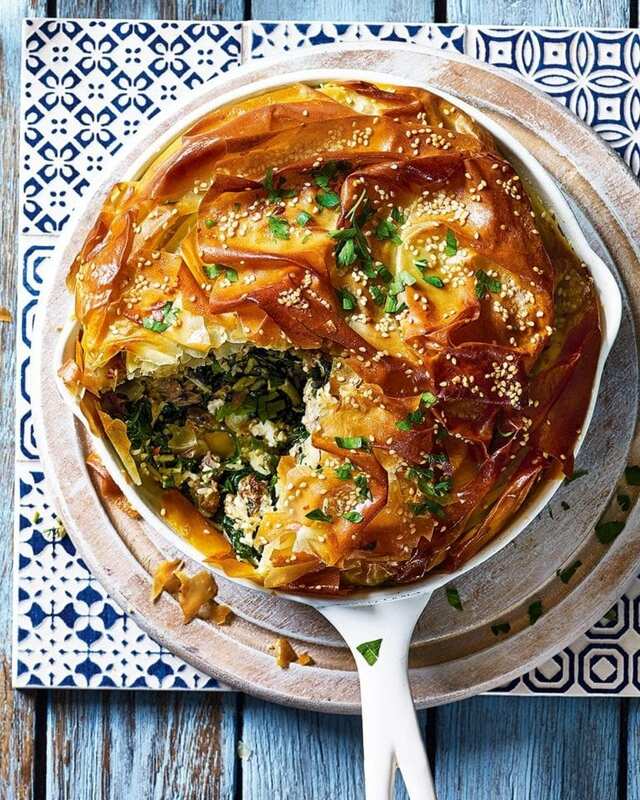 We love the rich, meaty addition of roast lamb but you could omit it and add another pack of crumbled feta and some roasted red peppers to make the pie vegetarian. Complete the pie up to 2 days ahead, then leave to cool, wrap well in cling film or put in an airtight container and keep in the fridge. Reheat in a hot oven to serve.